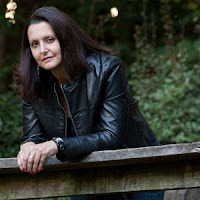 Fiktshun | 9:00 PM | Book Blast | Guest Post | Jeanette Battista | Leopard Moon Please comment! I'll be honest--I wasn't planning to write a book like Leopard Moon. I had an entirely different story in my head at the time, but it just wasn't coming into clear focus. That's the funny way writing works though: there I am, sitting at a red light on my way to meet my friends for a birthday martini and pedicure, listening to Florence + the Machine and WHAM! The song Howl comes on and this whole lovely scene just starts unfolding in my head. There was Kess, running through the woods, ripping off of her clothes as she triggered a change into a black leopard. And there was Cormac, standing in a different part of the woods being beaten mercilessly by the villain. I didn't know Sek was going to turn out to be Kess' brother, but I did know who he was as a character and what he wanted. It was truly a gift: the entire final fight scene just unspooled itself along with the song lyrics. Each beat of the song matched a key point in the fight. The more I listened, the more I realized that the lyrics could apply to all of the characters in the main triangle at some point in the story I suddenly wanted to tell. And I wanted that story to be more than just boy meeting girl--I wanted that story to be about girl saving boy, but more importantly about girl saving herself. The song Howl gave me Kess first and Sekhmet second, so a lot of what I tried to do with them was to show them as two halves of a whole, two sides of a coin. Howl, at least to me, wasn't a love song at all--it was a song about possession and obsession and all of those things that show up in our animal drives that we'd like to forget exists. So when I began to craft Kess and Sek, Howl played on a continuous loop. And though the song speaks of wolves, I knew these two had to be cats. Wolves have a more social nature and are more easily understood by us--I think it comes from them being a a precursor to our beloved dogs. Cats are an unknown quantity, strange and separate, even if they choose to share space with us. I wanted real darkness there, not just a brief bit of danger that would be easily resolved. Obsession and mental illness gave Sek that scariness, but also--I hope--a bit of sympathy. He really does love his sister and wants what is best for her and his clan. I never intended to excuse his behavior, but I did want to try and understand it. Fiktshun | 5:00 PM | 47North | A.R. 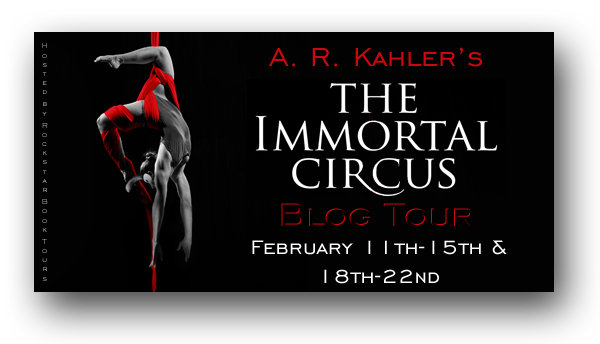 Kahler | The Immortal Circus | Tour Announcement Please comment! Hello again everyone! No, this is not a déjà vu. 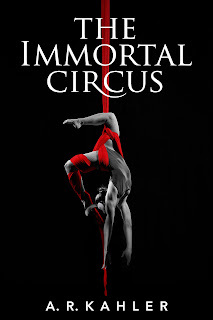 We are thrilled to be able to announce the tour for THE IMMORTAL CIRCUS by A.R. Kahler, which has heretofore only been available as a serial eBook release. Its official publication day for the completed novel in both print and Kindle format is January 29th - this Tuesday! And we are hosting this more traditional two-week tour to celebrate its release. The tour will run for two weeks - February 11th -15th and February 18th -22nd. 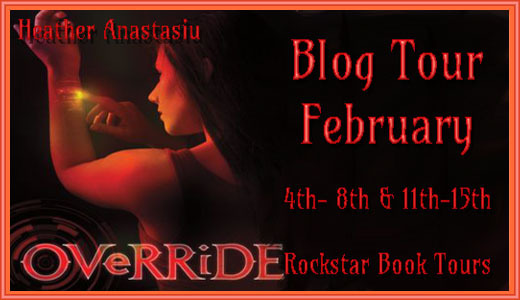 There will be one stop per day and the tour will consist of reviews, guest posts and interviews. The bloggers who are chosen as hosts will be required to come up with guest post topics and interview questions upon being chosen for the tour. There will also be a giveaway shared across all stops. Details on the giveaway TK. We are so excited to be able to put together this tour for THE IMMORTAL CIRCUS! This book is awesome - even though waiting between episodes for each installment has been torturous to say the least. 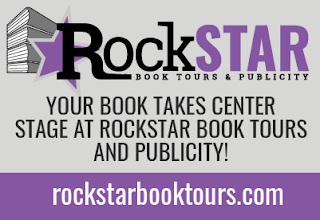 We hope you'll sign up to be a part of this amazing book's tour. If you'd like to know more, just read the description below or check out a few of the stops on the 10-week tour which is going on now! 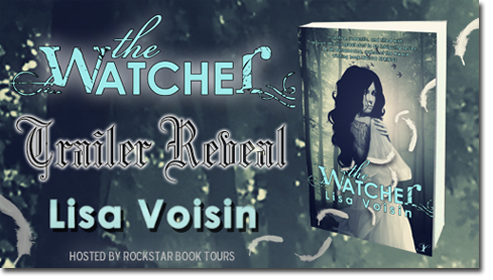 Fiktshun | 11:29 AM | InkSpell Publishing | Lisa Voisin | The Watcher | Trailer Reveal Please comment! Hey everyone! We are super excited to announce a Trailer Reveal we're doing for Lisa Voisin's soon-to-be published THE WATCHER. THE WATCHER will be releasing on March 4th and we're going to be revealing the trailer on February 4th - one month to the day before its release. 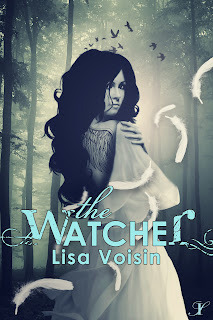 In addition to the trailer reveal, there is also a short excerpt of THE WATCHER that will be included in the post for those who just can't wait until March to find out more about this awesome book. 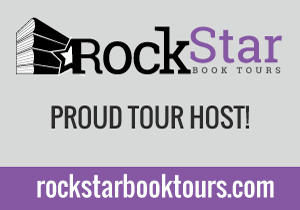 To be a part of this reveal you do NOT need to be signed up as a host with Rockstar Book Tours. EVERYONE is welcome to sign up and to help spread the word! If you can't post the reveal on February 4th it's okay to post it a little later that week. We're just so excited about this book - check out the description below and you'll see why - and we would love to get the word out. We're making the reveal easy. We'll provide the cover image, the blurb, the author photo and bio, excerpt and links, along with a link to the video and the embed code sized to fit most blogs. There also may be a giveaway with the reveal and so we'll be sure to include the Rafflecopter information if one is included. 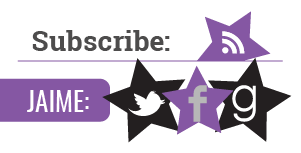 Additionally, we'll attach any graphics separately for those who can't grab them out of the Word document and we'll send a coded (for Blogger blogs) post for those who only want to be able to add their own touches instead of formatting from scratch. Everything for the posts will be sent out to those who sign up on Sunday, February 3rd. But if you'd like it a little bit earlier - on Saturday the 2nd - or if sign-ups have closed and you would still like to participate, just email us! Fiktshun | 4:00 PM | Book Blast | Guest Post | Jeanette Battista Please comment! Hey everyone! 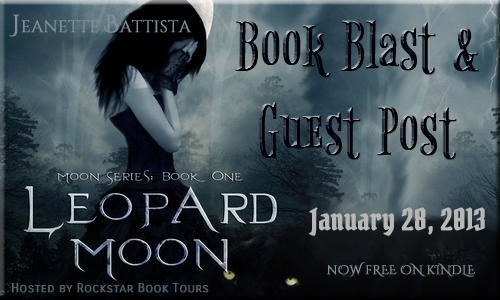 We are totally stoked to announce a Book Blast we're doing for Jeanette Battista's LEOPARD MOON, the first book in her Moon series. We know this is super fast, but we're looking to have the blast go out on Monday, January 28th to take advantage of the fact that until the end of the month, LEOPARD MOON will be free at Amazon for the Kindle. If you'd still love to participate but won't be able to get your post up on Monday, posting a little bit late will be fine, too. We're just trying to spread the word about this awesome first book in a series that Melissa Marr says is "... filled with action and romance, shape shifters and strong heroines"
The sign-up for the reveal will be super simple. We will provide the cover, the blurb, the guest post and all the links in a Word document. And for those who don't want to do more than "tweak" their posts, we will provided a coded post for Blogger blogs that you can just add your own flair to. We will send everything you need for your posts on Sunday. If you'd like it a little bit earlier or if sign-ups have closed and you would still like to participate, just email us! 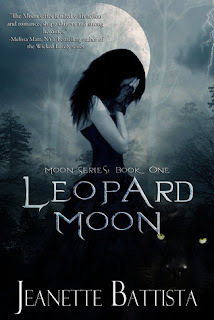 LEOPARD MOON is the first book in Jeanette Battista's Moon series. If you'd like to check it and the other books in the series - JACKAL MOON, HYENA MOON, and HUNTER MOON - out on Goodreads, CLICK HERE. Hey everyone! 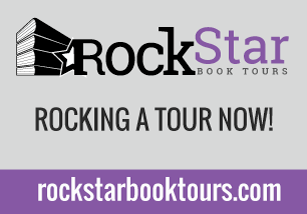 We are so unbelievably thrilled to announce this new tour for Rockstar Book Tours which will be coming in March! The book on tour is the very amazing MOONSET by Scott Tracey. It is the first book in the author's new series The Legacy of Moonset. The tour will begin prior to MOONSET's release and will run for three weeks - March 25th through April 14th 2013. There will be one stop per day - though we may consider doubling up on a few days during the tour - and will consist of reviews, guest posts and interviews. The bloggers who are chosen as hosts will be required to come up with guest post topics and interview questions by the beginning of February. 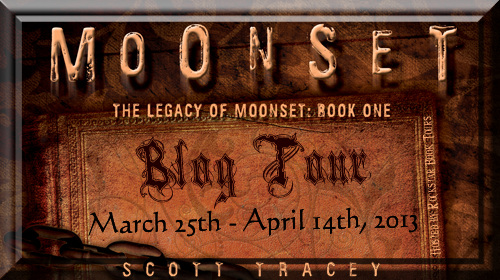 MOONSET is the first book in author Scott Tracey's exciting new series The Legacy of Moonset. 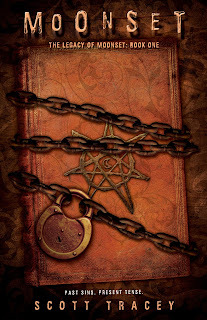 With a release date slated for April 8, 2013 this tour will be an awesome chance to get an early peek at this amazing book! Hey everyone! We're super excited to not only be hosts for these reveals, but to be participating in the reveals for author Brina Courtney's newly designed covers for REVEAL and CAPTURE - books one and two in her Cryptid Tales! 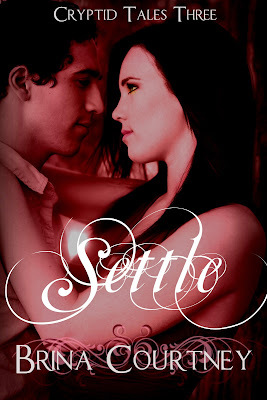 AND to be able to reveal the cover for the upcoming third book in her series, SETTLE. All three covers are below, along with their descriptions and places to find them online. 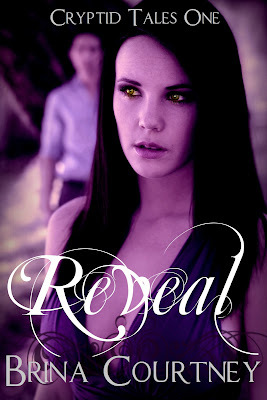 The first book in the series, REVEAL, is FREE in eBook format right now at Amazon and Barnes & Noble if you want to check it out. One thing is for sure, Shay is in for the fight of her life. In CAPTURE, Shay embraces other cryptids in order to defeat their common enemy. She is willing to die trying to save her father and the love of her life, Hugh. But can Hugh, her cryptid mate, protect her from the evil Malsumis? Or will she fall victim to his horrible plans? Shay's life has once again fallen into mystery as she discovers her father's whereabouts. On a mission to locate him and bring him home she learns more about who to trust than she thought possible. Her group of cryptids will be forced to rise again and defeat their common enemy, but they will also discover another hidden threat. As thier queen, Shay's discoveries in SETTLE, the final installment of the Cryptid Tales series, will shake the cryptid world forever. 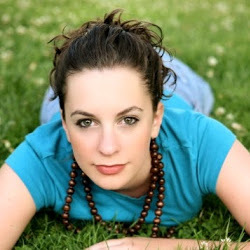 Brina Courtney is a young adult author obsessed with chocolate, crime shows, and fantasy movies. She's spent the last few years as an elementary teacher and a high school cheering coach. She lives in a small town in Pennsylvania with her husband and two very loud, small dogs. So now that you've seen them, what do you think? 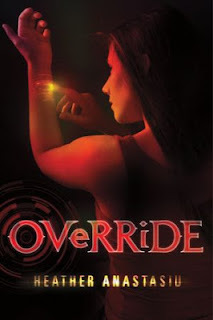 Fiktshun | 1:15 PM | Heather Anastasiu | Override | St. Martin's Griffin | Tour Hosts | Tour Schedule Please comment! Hey everyone! 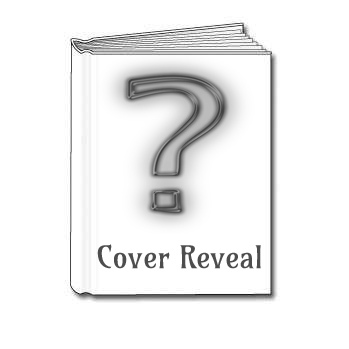 We're so excited to be able to announce that we're hosting a triple cover reveal for author Brina Courtney! Brina has had the covers for her Cryptid Tales redesigned and we will also be revealing the third never seen before cover! The reveal will run on Thursday, January 10th midnight EST and you can start posting your reveal posts after that time and anytime that day Thursday. When you sign up for this reveal the post will be easy. We will have the covers, blurbs, and all the links you need formatted into a word doc. so all you will need to do is post it! Click the sign up below if you'd like to sign up for the reveal. If you'd like to be considered to be a stop on this tour, please first sign up as a tour host and then fill out the sign-up form HERE. Sign-ups are OPEN. Here's some information about the books! One thing is for sure, Shay is in for the fight of her life. Shay is finally learning who she is, and who it is she will become. But for now escaping the clutches of the evil Malsumis will have to be enough. Or is it? In Capture Shay embraces other cryptids in order to defeat their common enemy. She is willing to die trying to save her father and the love of her life, Hugh. But can Hugh, her cryptid mate, protect her from the evil Malsumis? Or will she fall victim to his horrible plans?